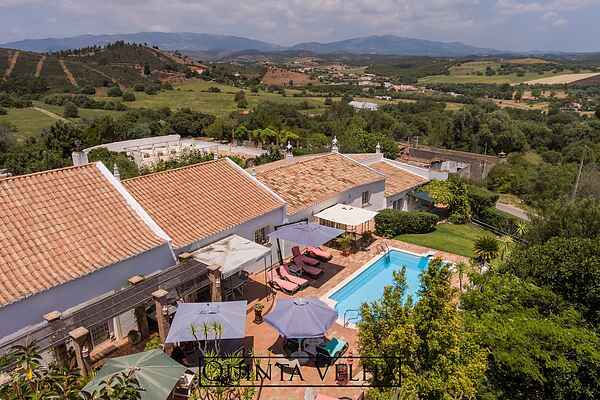 The appartment Papoula (even-levelled) is situated in a former portuguese farm, entirely renovated, at the foot of the Monchique-mountains, and close to cities such as Alvor (à 7km. ), Portimão by the river Arade (à 10km.) and Praia da Rocha. The house is equipped with several terraces, a communal swimming-pool (7x4x1,6m.) and a large garden. You can relax there, while being only 15km from the sea, the beach, a golf-course, vineyards and all necessary facilities such as shops, banks, pharmacies, etc... From the house, you can leave for pleasant hikes by foot or by car alongside the orchards and vineyards. Monte Canelas is located in Mexilhoeria Grande, a small historical village 5kms. from the house where you will also discover some shops and a nice market. In Alcalar (at 1km), you can discover excavations that go back 3500 years and interesting informations about the region. The appartments have been well-furnished in 2004 with new furniture. The high wooden ceilings and thick stone walls guarantee a pleasant freshness inside but also comfortable warmth in the winter. On demand, you can be supplied with a cage-bed and a crib. On arrival a small snack awaits you in the fridge, to celebrate your holidays right from the beginning!